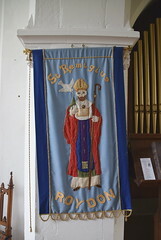 Roydon, the village, is not to be confused with its same-named counterpart miles away across the county near Kings Lynn. 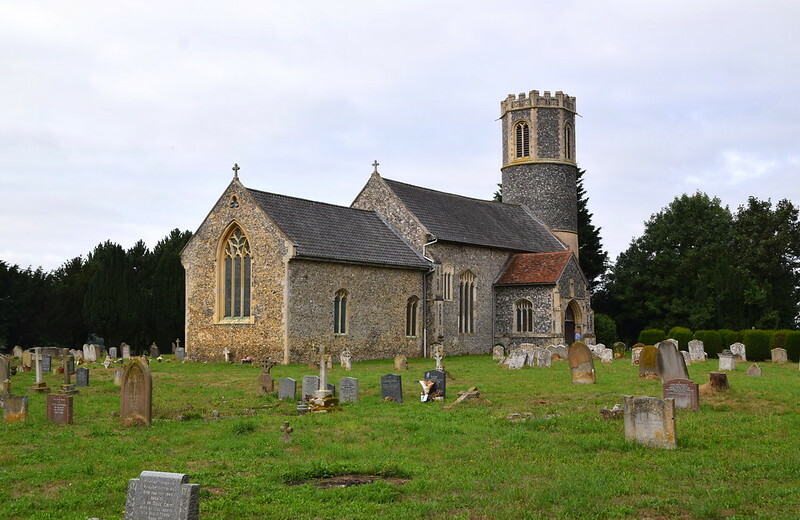 This one is a pretty place which we will be too polite to call a suburb of Diss, although its fine parish church sits down on the busy bottom road to Thetford overlooking the Waveney and all Suffolk beyond. St Remigius is a big round-towered affair, appearing grand in its wide churchyard behind the village pub. The church is open every day, and you enter through the north porch with its flushwork and five niches tiered above the entrance. It is in the Perpendicular style, and this is echoed by the crown of the tower, and the south aisle, and the east end of the chancel, and so you might think that we have a church here that is largely the work of the 15th century, apart from the tower itself. In fact, this is not the case. The top of the tower is Victorian, and so is the aisle, and so is the tracery of the east window, but they are done exceptionally well, and now seem wholly organic. 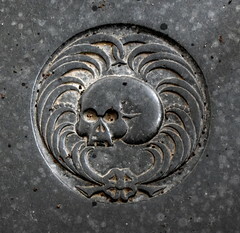 The body of the church itself is much older than the 15th century. 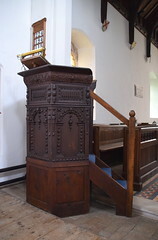 The vestry on the south side of the chancel is actually the medieval south porch, contemporary with the north porch and moved to this position by the Victorians. Where it once stood is now a very good suite of parish hall and meeting rooms of the early 21st Century, at once discreet and elegant. The ceiling of the parish room is made from an old cedar tree which grew in the churchyard which was diseased and had to be felled, so the timber was kept and made into ceiling boards. The cross in the room and the frames for the noticeboards are also made from the tree. This is the kind of thing which must always have happened in churchyards and churches over the century, a continuity of a kind. 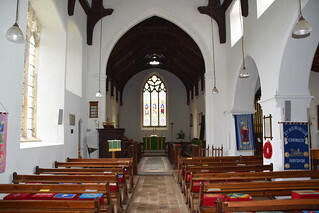 The quality and elegance of the exterior are repeated inside the body of the church, essentially a Victorian rebuilding, but the corbel heads in the arcade show that a Norman church was substantially rebuilt in the 13th century. Here in the aisle are two memorials to two sons of the Frere family who died barely a year apart, with spare and heartbreaking inscriptions. Temple Frere, we are told, was drowned when saving the life of a fellow-student at Trinity College, Cambridge. He died on the 4th April 1840, at the age of twenty-two. 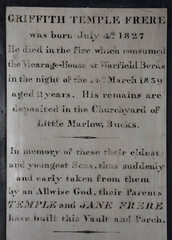 Beside his memorial is his brother Griffith Temple Frere, who died in the fire which consumed the Vicarage-House at Warfield, Berks, in the night of 14th March 1839. He was just twelve years old. Merit and worth, and their untimely doom. 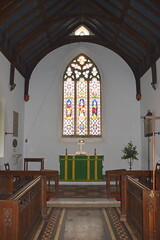 Simple, elegant coloured glass in the chancel completes the harmony of this pleasing interior. 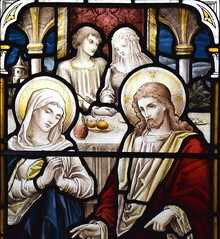 In the east window are St Susannah, St Remigius and St Elizabeth, which Birkin Haward thought the work of a local workshop. In the south aisle is a pairing of the Baptism of Christ and the Miracle at Cana which may be by Heaton, Butler & Bayne in their painterly 1890s style. Best of all is the decorative glass in the north chancel window, an Arts and Craftsy pattern of roses and lilies. All in all a pleasing and welcoming church, of no major significance perhaps, but greater than the sum of its parts.